Brynn frowned at the blue Ixi before her and sighed of exasperation. "Hanso, sword-fighting is a very important skill!" "Not to a thief! I'm quite fine with my dagger!" Brynn shook her head. "What if, on one of our quests, there are sword-fighters? Are you gonna use your dinky little dagger on their deadly weapons?" "Yeesh, no need to hate on my weapon." For emphasis, Hanso took his small dagger out and began twirling it in his hand. He leaned against the brick building beside him. "Brynneth, face it, I'm never going to learn to use a sword." Brynn glared. Hanso knew that glare. The do-it-or-else-I'll-make-you glare. He gulped audibly and put his dagger back in his pocket. "Brynn, please, I don't think I'd..."
Brynn held up a paw. "Hanso, sword-fighting is a--"
"Useful skill, great for adventurers, the weapon of our land, I know, I've heard it all week!" He grunted. "Please, Brynn?" Brynn looked up at the sky and covered her face with her two gloved hands. Then she uncovered her irritated face and looked back at her blue partner. "How about this... you try it out, just for tomorrow? If I see potential, or the trainers see potential, you keep learning. If not, you can leave." Hanso smiled. "How hard can it be?" 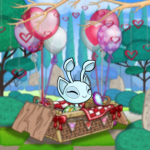 "Welcome to the Faerieland Training Arena!" The Light faerie looked at Brynn and Hanso with wide, clear crystal-blue eyes and gestured to the large room in front of her. On one side, there was a group of pets listening to a faerie's talk about swords. Next to them, there were demonstrations. There was a white chalk line dividing the circular room in half. The left side held dozens of pets, practicing their sword-fighting. Hanso gulped as he eyed an Acara and Bori fighting with steel, sharp swords. "Can't someone get hurt?" "We haven't lost more than five or six." The Air Faerie answered and Hanso squeaked. "I kid, I kid! We have medics in case! But no one's really been hurt!" She instantly yelled, but Hanso didn't relax. He scanned the room once more and looked at Brynn. "Can we leave?" "No." The Kougra grabbed his arm and pulled him to the talking faerie holding the steel weapon. "These swords are very dangerous, powerful, and can be even deadly. It depends on what kind you have. Experienced sword-fighters can have wonderful ancient swords, with mysterious markings and the blade deadly sharp..." A fire faerie rambled. She wore the Faerieland guard suit and was clutching the fancy sword in her right hand. An Air Faerie nearby was demonstrating the right way to hold swords and was teaching poses. "K, I think I'll go train... you stay with these faeries. Just ask them any questions if you have some." Brynn said as she turned to the other side of the room. "Can't I go with you?" Hanso asked, clutching her arm. "Um... you have to be certified to be on that side..." she muttered. Hanso looked and noticed finally that the pets there were professional and could swing their swords straight and true. He then noticed Jazan leaning on the wall, a faerie next to him, talking. He finally saw Altador talking to a small Lupe, who suddenly kicked the King's shin and ran away laughing as Altador yelled curses. "...was this all a plan?!" Hanso almost screamed. Brynn cringed. "Well, you're a little stubborn... and we like going here to update our sword skills... if you knew already, you'd be joining us!" She snapped as she shook Hanso's hand off her arm and crossed to the other side of the room, nodding at a faerie that stood guard at the chalk line. Hanso sighed heavily and tried to relax. He felt tense. Never had he held the steely weapon and he wasn't exactly planning on it. But a faerie suddenly walked up behind him and dropped a wooden sword in the Ixi's hand. "Hanso, correct?" "Yes," Hanso growled, not turning around to see what kind of faerie or who really, had given him the light weapon. He also didn't like the fact Brynn and everyone had planned this... as if they didn't trust him! Like always. "You'll be training with Siana." The faerie pointed and Hanso turned to see a Fire faerie surrounded by lots of small children holding wooden swords. "You'll be starting at the Level One, unfortunately, but you'll get higher soon." Hanso groaned and shuffled over to the large band of wild kids. One screamed and tackled him and he landed hard on his back. Training with kids... ugh. It wasn't going to go fine this way! He pushed the kid off and ducked from her next tackle, then brushed off his coat. He gripped the wooden sword tightly, and got a splinter in the process. Yelping, he shook his injured hand. This was safe to give to crazy children!? He then had an idea... he remembered the shiny, ancient sword that Fire faerie had been holding, the one that was blabbing about its history. Maybe if he got to it... with his usual thieving skills... and somehow crossed the room, he'd be with Brynn and convince her that he got highest rank already! Then she'd be off his case! It was risky, yes, but it'd be better than training with crazy children. He raised a hand. "I need to use the restroom." He told the faerie... Siana? Siana nodded. "Go on ahead." Hanso ran off, but didn't duck into the men's bathroom. He made a U-turn and snuck past unsuspecting faeries. He snuck up to the fire faerie, who was still talking. The sword was leaning beside her against the wall. The people listening to her talk were looked away at a chart she was gesturing to. Hanso gripped the sword's handle and quickly snuck off, quiet as a shadow. He stopped at the restroom door and examined the sword. It was heavy in his hands, heavier than he thought. He held it up and down with both hands, then gripped the handle only. The steel blade narrowly missed his foot. His eyes widened and he moved it away. He slowly brought it up and swung it slightly. It made a swish as it sliced the air. Hanso grinned with pure delight. The intricate design on the sword was in blue, and shone in the black hilt. The sword had a design too, etched into the shining silver metal. Hanso swung a few more times for good measure, then headed Brynn and Jazan's way. The two were practicing with each other. They didn't see him. Hanso nodded to the faerie at the line, who nodded back as Hanso passed the white line. He had made it. "HANSO!" Brynn screamed, startling the Kyrii beside her, making him trip mid-swing and fall flat on his face. "What are you doing here?!" Then her eyes widened when she saw the sword he was holding. "Is... that..."
Hanso grinned. "Yeah, the faeries said I showed true potential and skill," he said, trying to seem cool and collected, when really his heart beat rapidly for lying to Brynn. Plus, Jazan's gaze at the sword was making him uneasy. "And they saw I was beating the cream out of everyone and gave me this!" He shut his eyes and smiled with fake pride. "...I should've watched you..." Brynn muttered to herself and him. "Well... this is great! You can practice with us! You know third-swing?" One of Hanso's amber eyes widened. "Da what?" "Oh! Yeah, yeah... all those." His palms began to sweat and the hilt began to slip from his grip. He changed it to his other hand and wiped his other on his coat. "They sent me here... but can I watch you... to get the feel of how you do it?" Brynn blinked, then shrugged. "M'k. I would think you'd know by now... especially with the wraiths and all..." She nodded at Jazan. The Kyrii glared at Hanso, then removed his sword. Hanso watched with an open mouth as the two swung at each other, blocking hits, ducking, rolling out of the way, swinging certain ways to throw the other off. They never beat each other. Hanso only heard endless clangs and swishes of the flying swords. Then the two parted, nodded at one another, and replaced their swords. "So, Ixi..." Jazan crossed his arms. "You got Nalie's sword?" "Nalie. Fire faerie." He jerked a thumb at the still speaking faerie. "...Uh-huh. Gave it to me." "Why didn't you get the training swords, like all the others?" "...I'm a hero. Showed potential." Brynn gave a weird look. Jazan grinned. "How about you and I have a match? Show me what you're made of!" His look drilled into Hanso and made him want to run. Jazan knew. He was going to make the Ixi look like a fool. Stuttering, Hanso finally shut his mouth and held out the sword. "Mm... m'k..."
"Good." Jazan removed his own and placed it across Hanso's. "Let's go." Hanso screamed at the first swing, which was aimed right at his face. He ducked quickly, natural instincts, and felt as if the sword cut off a small bit of his hair. NOT THE HAIR! The sword came again and Hanso quickly blocked it, staggering. The sword was sharp, he could tell. Jazan was laughing now as he backed Hanso up. The Ixi didn't notice, just yelped and tried to get away. Finally, he fell over and was on the other side of the chalk line. "Where you belong," Jazan snickered before replacing his sword and walking off. Brynn knelt down beside Hanso. "Why'd you lie?" Hanso stared into Brynn's blue eyes. "Brynneth... I'm sorry, but I can't practice with the children! I never wanted this anyway!" He rubbed his arm, where the Kyrii's sword had grazed. "I...I like being a thief better than a sword-fighter." Brynn sighed. "Hanso... it's better. But... I'll teach you myself, if you want." Hanso smiled. "You mean it?" Brynn nodded. "Yes. Now, let's go and I can start you on the basics." "...one moment." Hanso jumped to his feet and approached Jazan, who was talking to a faerie. Brynn's eyes widened. "Hanso, what're you doing?" "Something." Hanso called back and stopped at the Kyrii's side. "Hi, Jazan." He grinned wickedly. "Thief, you don't belong here." Jazan waved a paw. "Or do I?" Hanso grinned and reared back, then stabbed his sword through Jazan's shirt, pinning it to the wall. The sword went in all the way to its hilt, trapping the Kyrii. "There." Hanso brushed off his hands and began to walk away. Jazan's eyes widened as he tried to pull away from the wall. No luck. He was truly trapped. He watched Hanso stride over to Brynn. Jazan panicked. "Ixi! Come back and take this out! IXI THIEF! HANSO!" Hanso laughed. "Come on, Brynn." He snickered. Brynn glanced back at the faeries crowding the screaming Kyrii and followed Hanso. "Oh, Hanso... where do you get this stuff?" "Oh, you learn some things after a while..."
The Committee of Awesome Vacation Spots Planners has compiled a list of... wait for it... awesome vacation spots!